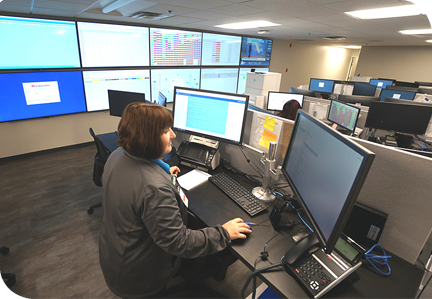 Albany, Ga. – Phoebe has launched a state-of-the-art patient logistics command center. Phoebe Care Command combines the latest in predictive analytics and innovative problem-solving to better manage patient safety, experience, volume and the movement of patients in and out of the hospital. “Phoebe Care Command is the only center of its kind in the state of Georgia, and we are very proud to be able to bring this technology to our hospital – allowing us to better serve our patients. We understand that when your doctor says you’re ready to go home, you do not want to wait for hours to be discharged. This new center will change that here at Phoebe,” said Kim Whitley, Vice President, Patient Logistics & Care Coordination. The command center, brings together representatives from every department that affects patient flow and patient experience. The center is equipped with software and technology from Teletracking, the world leader in patient flow solutions. The high-tech systems and computer monitors show real-time and predictive information to resolve bottlenecks, reduce patient wait times and coordinate services. The technology in Phoebe Care Command keeps staff members informed about when there is an influx of patients in the hospital, the need for and availability of beds across the hospital, the highest-priority admissions and discharges, and other important information for ensuring high-quality patient care. “The center allows us to drastically decrease patient wait times by consolidating the logistics of patient flow. In the first few weeks, we have reduced the average time inpatients wait to be taken for x-rays or other imaging services by 92%,” added Whitley. By admitting patients quicker, Phoebe is reducing wait times for patients who come through the emergency department. Additionally, the planning process for discharge is started well in advance, creating a more efficient and seamless process. And, when it is time for a patient to leave, Phoebe’s transport team knows immediately to go to their room to get them, followed by immediate notification to the environmental services staff to clean the room so it’s available for the next patient right away. As part of the $2.5 million investment to stand up Phoebe Care Command, the hospital is hiring more than 30 employees to help staff the center.